Mersey Basin Campaign Blog: Floating Garden Festival helps to raise money for East Cheshire Hospice with a little help from friends. Floating Garden Festival helps to raise money for East Cheshire Hospice with a little help from friends. The Floating Garden Festival was one of the highlights of the Cheshire’s Year of Gardens ’08 programme. The Festival helped to highlight and promote the beautiful inland waterways of Cheshire. Four florally decorated heritage boats departed from Audlem, Bollington, Trafford and Ellesmere Port and various events were held enroute as the boats made their way to Middlewich for the annual Folk and Boat Festival. The British Waterways heritage boat Lindsay left Bollington and floated along the canal through Congleton and Rode Heath. Congleton Tourism Officer Phillippa Brown said, “I would like to say a big thank you to all the local societies and groups that donated many of the floral displays on ‘Lindsay’. These were Rode Heath Methodist Church, The Church of the Good Shepherd (Scholar Green), the Rode Heath Village Hall committee, Rode Heath Cubs & Scouts, The Macclesfield and East Cheshire branch of the British Cactus and Succulent Society, Poynton Home Gardeners Club, Alsager Gardens Association, Brereton Playgroup, Theresa Hunt of Odd Rode Parish Council and Harding Consultants. These displays really helped the boat to look spectacular and helped Lindsay win the ‘Best Dressed Boat’ title. 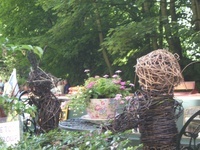 A special thank you also goes to Dane Coppice Crafts who created an Alice in Wonderland and Rabbit sculpture out of willow, which looked fantastic and really helped to make the display special. All these donated tubs and baskets were auctioned off on the last day of the Folk and Boat Festival and managed to raise £320.20 for East Cheshire Hospice, which is fantastic!”.